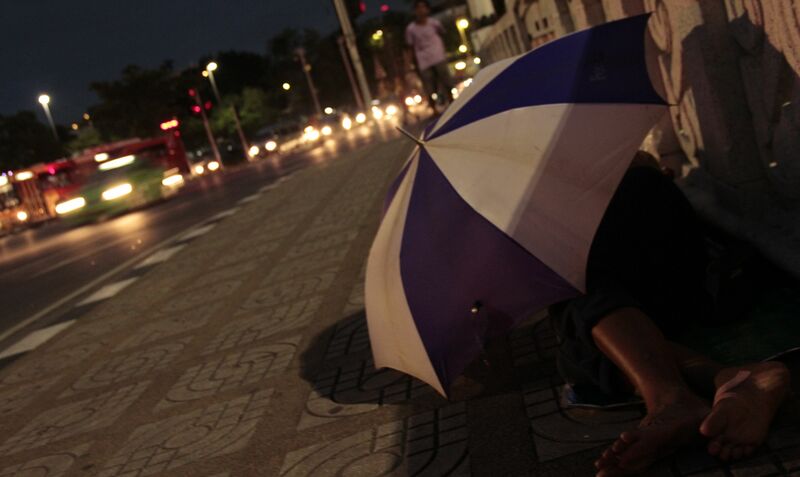 Homeless in Bangkok, now that’s stressful. Am I the only one who…? I get the feeling that no matter how one finishes that sentence, the answer is an emphatic “no.” I doubt there are any problems humans have that are unique to themselves. And there are probably a few dozen blogs about each issue too. 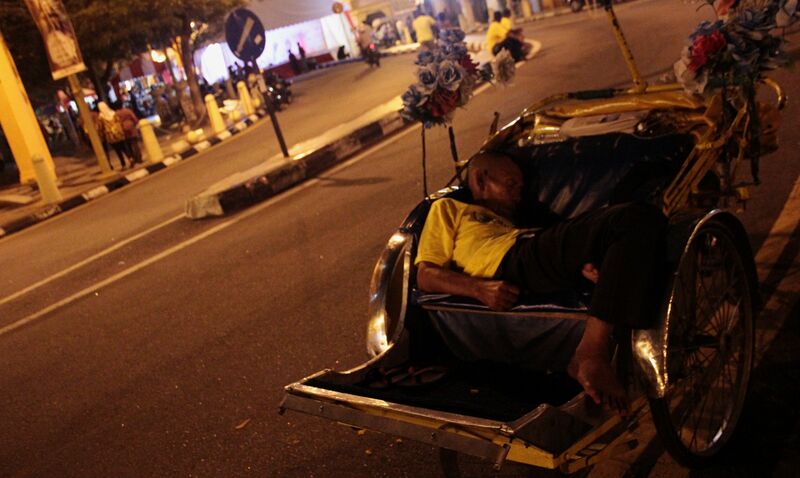 Malaysian rickshaw driver: more difficult life than mine, better sleep. So I bet I’m not the only one who has trouble figuring out why they’re stressed. Am I? Life is stress, I realize that (quit your whining, boy! ), but even though I can think of a few decent reasons why, I am still surprised at waking up every morning with sore teeth and an exhausted jaw. This morning I got up and was feeding our porch cat when I found a little sand grain of chipped tooth rattling around my molar’s neighborhood. That can’t be good. And things are going well, damnit! What inner part of me can’t see that? 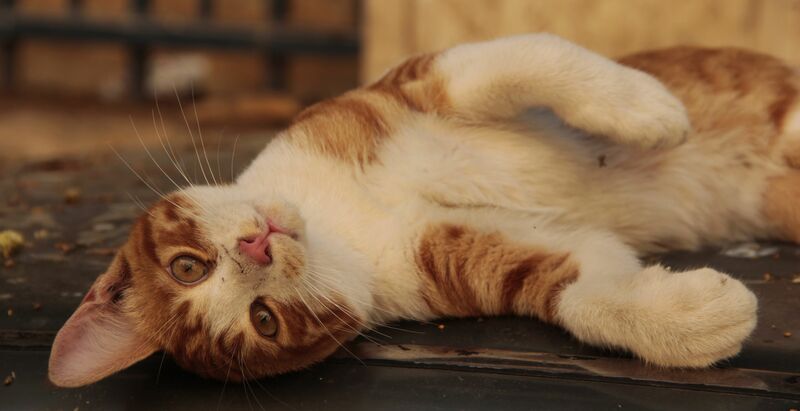 Jerusalem cat wants to listen to your problems. I just read an account of modern day slavery in Mauritania. Sweet Jeebus. And even my own memories of life in Zambia (and researching the riots that broke out a few months after we left where frustrated residents living in poverty burned three men alive) remind me of how insanely lucky I am. So why the tension? First World problems, man. How do you tell what’s bothering you? I always know exactly what is bothering me. Makes me wonder if it is a long term thing that is causing you anxiety, so long term you just don’t even see it anymore? Like it’s just perfectly spread out with your other thoughts. That’s entirely possible. I’ve got a couple good guesses for what it could be, now it’s just a matter of taking steps on them, one at a time, and seeing what helps. My theory–and that’s all it is, a theory–is that, regardless of their circumstances, people will always identify problems that they have. Relativism evidently has its limits. Yup, grinding away. I could put a rock in there before bed and spit out gravel when I woke up. I considered a mouth guard a few years ago when I went through a bout of this, but I’m a little worried it would give me boxing dreams, and I’d wake up with my fist through the window…I’m not a boxer, but I play one in my dreams. Definitely get yourself a guard to use at night – it cost me a lot of money at the dentist to fix the damage I was doing to my teeth at night. I felt that I was chickening out by buying one: I felt that I should have been able to figure things out by myself and stop grinding my teeth at night, but I never did. Maybe you will do better than me in understanding things, but get a guard till then. By the way, did you ever work out why losing your watch upset you so much? Maybe there could be information there. I wouldn’t feel like I was chickening out, I think there’s nothing wrong with getting assistance while you work on stuff, but I just wonder if I would be able to sleep with one of those things in, and not just spit it out as soon as I’m asleep. The other issue of course is that, being an American, I don’t have health insurance…although signing up for it is on my medium To-Do List. Well, considering my tooth has been achy for the past couple days, I’m moving it to the Short List. And indeed, very perceptive, you’re right that the underlying problem of the watch days is still here. Bit by bit, I guess! Seeing other people in problems should not make you feel better or good. It does not (should not) work that way. For the answer you are looking for people often pay nice amount per hour. Sometimes it helps to get a different perspective on things. P.S. go see your dentist and ask for a splint to wear at night. Some say it helps. Cancelled flight, no good! Sorry to hear that! I gnash my teeth at them now! You’re right that seeing other people’s problems doesn’t make me feel good, I just want to keep my perspective on what really constitutes a “difficult” problem. I’m feeling better already, while things in the Philippines are still horridly messed up. I hope your flight is rescheduled for a good time, and the rest of the trip goes well. Is this Berlin? I am a big fan of introspection. As are you, I’m sure, because you blog, so, of course. But at the point where it’s not leading anywhere I have an alternative: find something useful to do. I know that sounds very dismissive and everything but from experience it totally works. You’ll be too busy to think and you’ll have a vague feeling of getting somewhere. Doing useful things is like general anaesthetic – it works no matter where the pain’s coming from. Not dismissive at all, it’s actually exactly the conclusion I’ve come to, that I need to break up my ball of inertia. I will definitely come asking you for advice next time too. ; ) I have a couple options getting started…more to come soon, I hope…though I can’t tell if I would prefer them to work out well, or just disastrously enough to make good stories. It’s win/win! The beauty of blogging! Every less-than-ideal moment makes an excellent post. And some of the ideal ones do, too! Hurrah!